The latest issue of the Automotive News Europe monthly magazine goes live on Monday. 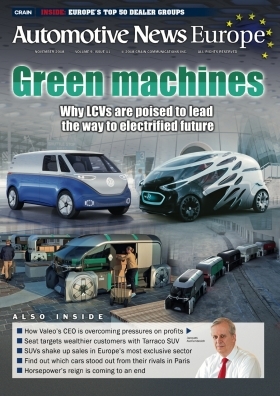 The new edition looks at why electrification is emerging as a viable option for light commercial vehicles, helped by a big push from European and local pollution regulations. As with battery-electric passenger cars, sales of full-electric LCVs are currently tiny, but automakers are expanding their lineups and displaying futuristic delivery concepts. New players from Europe, Asia and major suppliers plan to enter the market. In some ways the sector is perfect for mass electrification, experts say. However, the relentless focus on cost by fleet owners and individual van buyers alike means that the price gap between internal combustion and electric powertrains is harder to overcome. We look at this pivotal sector in our cover story. Light commercial vehicles are playing a bigger role at Opel/Vauxhall under PSA Group ownership. Responsibility for future product development for the entire group will take place at Opel’s technical center in Ruesselsheim. Tobias Stoever, senior manager for LCVs at Opel, discussed the changes. Toyota’s European sales are heating up, as demand for its hybrid models soars in response to the diesel backlash. The surge moved the automaker closer to matching its record of 1.2 million units sold in 2008. This time, however, the growth is profitable, sales boss Matt Harrison told us. Overtaking Toyota to become the top-selling Asian automaker in Europe has long been the aim of Nissan and Hyundai. But the goal has become a lot tougher as Toyota finds its stride with new models and its hybrid offerings. Nissan briefly rose to No. 1 in 2015. But by the next year, Toyota was back ahead. Meanwhile, Hyundai wants to pass Toyota by 2021. More changes are expected in the years to come. Europe’s ultraluxury automakers including Ferrari and Aston Martin are gambling they can keep their exclusivity while simultaneously breaking into new genres such as SUVs. The new arrivals are poised to cause big changes to Europe’s most exclusive sector. The new Tarraco gives Seat an upmarket model that will “enable us to enter the 30,000 to 40,000 euro price range,” Seat President Luca de Meo said. We review the Tarraco in our Latest Launches section. Valeo has kept pace as the automotive industry moves toward more electrification and autonomous driving technology. The company, which is a leader in traditional parts such as windshield wipers, is also a pioneer in future technologies such as the lidar systems that will be crucial to self-driving vehicles. Valeo CEO Jacques Aschenbroich spoke to us about how the French company is adapting. Switzerland’s Emil Frey is now Europe’s biggest dealer group based on revenue after last year’s purchase of 275 sites from the Volkswagen Group, according to a new report by dealer analyst ICDP. We look at all of the big moves in our annual Guide to Europe’s Biggest Dealers. Continued uncertainty over international trading conditions, profit warnings from two leading German manufacturers and the sudden death of a chief executive all contributed to declines seen in the latest shareholder value report. With the mass-market introduction of electric vehicles, the term “horsepower” has outlived its usefulness. We suggest the adoption of a new term in our Final Word.